Tourists love Mexico for its beautiful beaches, booming resort industry and location but if you needed another reason to travel to Mexico, allow me to introduce: Noche de Rabanos, or Night of the Radishes. This evening festival takes place in Oaxaca city and is a celebration of the radish that features an exhibition radish sculptures and re-creations of grand scenes such as historic events or nativity scenes. 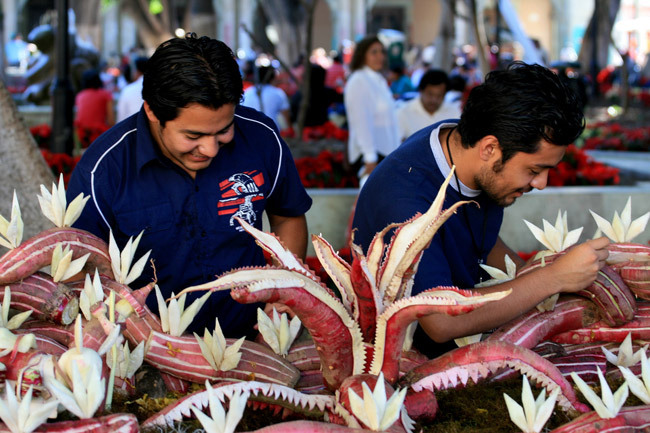 The festival takes place on December 23 and is incorporated into the usual holiday activities in Oaxaca. The radish arrived in Oaxaca with the Spanish in the 16th century and the first radish festival occurred in 1897, but the origins of the festival are unclear. There is a legend about two Spanish missionaries who encouraged the indigenous people to cultivate radishes and sell them at a market. They suggested that by carving the radishes into little sculptures they would increase the buyer’s interest. The modern festival radishes are specially grown with extra fertilizer until they grow very large, to allow more elaborate carvings. Growers drop them off to artisans only a few days before the festival and carvers work furiously to produce a competitive radish sculpture in time for the festival (and before the radish goes bad). If you’re in town for Noche de Rabanos, grab a room at the beautiful Camino Real, a hotel housed in a 16th century building – a former convent and one of the city’s landmarks. Enjoy an extravagant breakfast buffet in what was once the convent kitchen before heading out to see the sights of Oaxaca – to see the birthplace of Noche de Rabanos, take a tour of Trinidad de las Huertas Church and see the traditional radish growing region and enjoy some fresh market produce and fresh juices. Schedule an early dinner at the Casa Oaxaca and be sure to get a rooftop table. The five course tasting menu is $32 per person and features quality local cuisine and fine wines. After dinner, head down to the festival to peruse the radish sculpture submissions and stay for the judging, which usually happens at 9 pm (there are categories for children and less experienced artisans). There is a 15, 000 peso grand prize for the best radish sculpture or scene. There are also competitions for depictions made with dried flowers and corn husks, both are traditional folk arts in Oaxaca. Enjoy illumination shows, musical acts and the annual fireworks display and try the bunuellos, deep fried pastries in syrup that are very popular during Christmas time.